southern orders : SO MUCH FOR POPE FRANCIS' FAKE NEWS MONIKER, "WHO AM I TO JUDGE?" SO MUCH FOR POPE FRANCIS' FAKE NEWS MONIKER, "WHO AM I TO JUDGE?" 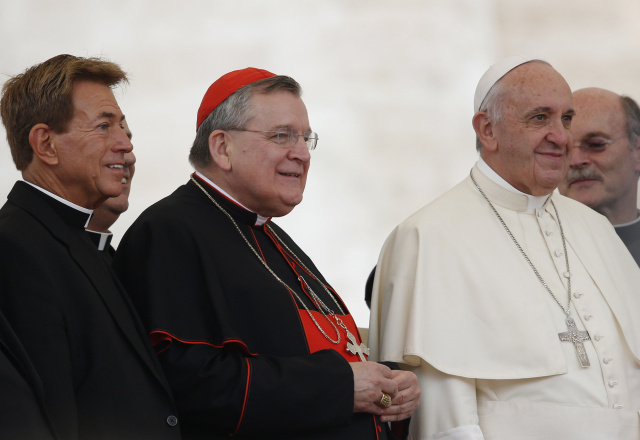 Is Cardinal Burke a rigid orthodox prelate prone to live the hypocrisy of a double life since he rails against the very things he is doing (supposedly, theoretically) compared to the pope who is flexible, understanding and willing to offer Holy Communion to those who publicly live disordered lives and thus not hypocritical? THE POPE JUDGES THE RIGID AND DENOUNCES THEM! What Pope Francis preached about this morning at the chapel of the Spirit of Vatican II Motel 6 is exactly what I heard in so many classes and homilies at the main chapel and the mini-chapels of St. Mary's Seminary, Roland Park, Maryland between 1976-80. Don't get me wrong. I don't like rigidity either. But I happen to think it affects progressives as much as conservatives or should I say the orthodox/fundamentalists and the heterodox/marshmallows. I happen to believe if one is too rigid in religion, human relationships and life in general, they will break. I also believe that those who cannot be pinned down to anything and are like butterflies landing on every new flower and fad, that this betrays a psychological disorder too. Are rigid conservatives more prone to be hypocritical than flexible heterodox? Yes, of course, since the flexible heterodox don't believe in rigid doctrines, dogmas or morality. So if one believes that it is just fine publicly and in the light of day to commit adultery, fornicate, avoid helping the poor and living out disordered passions, there is no hypocrisy since this is their moniker! Of course it is of the devil. I would love to know if statistics are available showing the comparison of Catholic priests who live double lives or abuse those in their charge is greater among the rigid conservatives compared to the flexible progressives? Are rigid conservatives more likely to abuse teenage boys compared to the flexible progressive priests? Is there any study on this? Of course it makes news when one who is a rigid orthodox railing against all the sexual and social immoralities of the day only to find out that this person is leading a double life and doing exactly what he hates. It is a form of self-hatred, no? But if a flexible heterodox does what he approves of, there is no news in that, no? Also, some rigid orthodox Catholics know full well that if they become flexible heterodox they will live a life of promiscuity, be it gay, straight, bi or what ever other disordered license they would easily give into. So their rigidity is a grace from God to assist them from falling into the sins they are very well tempted to do if they were flexible heterodox, no? Pope Francis preaches at the morning Mass at the Casa Santa Marta. (Vatican Radio) Even now there are people in the Church who use rigidity to cover-up their own sins. That was the warning of Pope Francis at the morning Mass at the Casa Santa Marta. Commenting on the first Reading, from the Acts of the Apostles, the Pope focused on the figure of Saint Paul who, from being a rigid persecutor, became a meek and patient proclaimer of the Gospel. “The first time the name ‘Saul’ appears,” he said, “is at the stoning of Stephen.” Saul, he observed, was a “young man, rigid, idealistic,” and he was “convinced” of the rigidity of the law. Others, he said, “use rigidity in order to cover over weakness, sin, personality problems; and they use rigidity” to build themselves up at the expense of others. Pope Francis said that in this way, Saul grew even more rigid, to the point where he couldn’t tolerate what he saw as a heresy; and so he began to persecute the Christians. But, the Pope said, parenthetically, at least Saul allowed children to live – nowadays, those who persecute Christians don’t even spare children. Rigidity is not exclusive to conservatives, religious or not. There is a secular rigidity too! There is news this morning that a family with two small children were evicted from a Delta Flight because the dad was unwilling to give up a seat he had paid for his 18 year old son, who had taken another flight and the dad wanted to use that paid for seat for one of his toddlers. However, the law rigidly enforced by Delta's personnel said he couldn't do that and that the seat had to be used by the person whose name was on the ticket. So I would say rigidity to civil law can be problematic in some cases too. But let's get back the the flexible Pope and other flexible cardinals, bishops and priests--when oh when will they celebrate the EF Mass publicly in the day of light and not hide their celebrating of it??? Can't they be flexible enough to celebrate this nearly 1,800 year form of the Mass? Are they to rigidly opposed to it to do so? I think there is a more hypocritical inflexibility on the part of the heterodox. They have dogmatized their flexibility, and they require strict adherence to their flexibility, or what they perceive to be their flexibility. Francis is a good example of this -- he advocates for a reduction of what-he-perceives-to-be rigid systems, but he advocates that position rigidly in that he insults and condemns those who disagree with his non-rigidity. As the saying goes, "There is no absolute except that there are no absolutes." The rigidity of the Church's teaching and the attempt by people to follow that teaching does not mean that those people lack meekness. Humbly attempting to submit to established rules is precisely the sort of meekness that the Church has always demanded of people. Conversely, for the authorities to attempt to subvert the established order of the Church is prideful hubris, the opposite of meekness. The difficulty in following established rules is not a reason to undo those rules. It is just an incentive to better assistance by the Church to help people to know and follow. This can be summed up in the advice given to confessors: "Be a lion in the pulpit, but a lamb in the confessional." That is, preach the rigidity, but exercise flexibility when presented with particular circumstances. The pope and those of his ilk, instead of following this sage and saintly advice, are simply attempting to undo all sense of law. That does nothing other than bring about the appearance that the law isn't being violated. But since the law is objective and not subject to their attempted changes, the effect is only apparent and not actual. In their eyes it is worse to be a hypocrit than to doubt Christ. So they refuse to accept certain things so they can't fail in them. They denied the EF so they believe admitting that they were wrong would be admitting to hypocrisy. They dred their own hell more than God's. I have said this before, Progressives implemented the spirit of V II IN THE MOST PRE-Vatican II Dogmatic, authoritarian way! Prayers against rigidity apply to so many within the church at all levels for if they didn't, things wouldn't be as they are today. We should pray for all who are rigid - leaning toward one extreme or the other that we who are members of this body can be freed of tiresome and distracting debates such as this, be protected and nourished by our inheritance (the sacraments and tradition) and focus on our salvation. Those that continue one way or the other to distract the faithful will ultimately have to take responsibility before the judgement seat for so doing. To your introductory question Father, and in my humble opinion, I do not believe that Cardinal Burke is rigid and prone to hypocrisy. He is stylistically traditional and as best as I can tell from my vantage point, lives a life of meekness and compassion while preaching the gospel. A preference for tradition does not result in rigidity. Embracing fundamentalism does result in rigidity. At the same time a preference for 'contemporary' worship does not result in rigidity however, preventing traditional worship, administration of sacraments and compromising tradition and doctrine does result in rigidity. To me, sinfulness and sinful lifestyle choices regardless of their placement on the rigidity spectrum are self explanatory relative to this discussion. I have met rigid Christians, but very few of them. These few usually seem to suffer from some underlying emotional problem, one which requires flexibility on our part. That said, rigid Christians are so few in number that it's hard for me to understand why the pope is so obsessed with them. I wish he would concern himself more with faithful Catholic families, who all need his pastoral solicitude. There is nothing and no one as unyielding as a rigid liberal. I happen to think it affects progressives as much as conservatives or should I say the orthodox/fundamentalists and the heterodox/marshmallows. This comment got me thinking: when is a marshmallow "rigid"? Rigid progressives and rigid traditionalists are equally stale. In my experience, rigid progressives abound and are a big barrier to moving ahead and putting the Church's generational problems in the rear view window. While rigid traditionalists are pretty hard to find in real life, too few to be a real problem to anyone. Everyone remembers those famous words of Christ: "Be ye flexible even as your Heavenly Father is flexible." Rigid is a loaded, even negatively loaded term. Anyone using it, especially in an opening sentence arguing a point, is advocating an ideological position with little regard for facts. Habitual law-breakers use such terms to avoid justified retribution for crimes committed. Social Justice Warriors, who usually claim to be so humble and tolarant, are the ultimate rigid characters anywhere. If you hear "rigid" used expect to hear a lame justification from a liberal who just been found to have broken a law and wants to avoid the consequences of his self-indulgent actions. Fr. Fox, I like your analogy although I must have been thinking of it subconsciously. A marshmallow isn't rigid until it is stale and stale is the 1970's! Traditional Christians aren't rigid. The Sacred Tradition promotes progress in knowledge and virtue, and this progress takes a lifetime. So, to be a traditional Christian is to be a spiritual progressive. The new religion established in 20th century may call itself "christian" or even "catholic", but it lacks the flexibility needed to remain faithful to the past, hopeful for the future, and charitable in the present, while simultaneously promoting the virtuous growth of its members. Are you participating in a knock knock joke? Let's talk rigidity: who on this blog observe meatless Fridays? If you slip up or find youself in a situation where you can't (e.g. trapped inside a cow and forced to chew your way out). What, in a situation like the cow disaster, do you do about it? Do you consider the observance of meatless Friday to be rigid? I find fish to be flexible, whatever day of the week. Beef jerky is rigid. "Rigid" is a stupid term to apply to the truths of Scripture and the doctrines of the Church. There are absolutes in theology and doctrine. Too bad if you cannot handle that. But, I love the liberal phallic obsession with words like rigid, stiff, flexible, etc. I think they have a hang up on their hang downs...probably envy. Dialog, i have over cooked tilapia until it was preserved for all time. I guess the rigid people actually do what the hypocrites talk about but just don't make a fuss over it. I am always amazed when people become offended at me for abstaining or fasting when I don't even bring it up. I really believe they didn't just forget but know exactly what they are doing and, like school boys playing hooky or smoking behind the gym, they are angry at anyone who does not go along and become distrustful of them. IT IS TRULY VERY SAD; WHERE IS THE HUMILITY? WHERE IS SAINT PATRICK WHEN YOU NEED HIM?????? WERE YOUR MOMS BLESSED AT MASS TODAY???? DO CATHOLICS HAVE TO BELIEVE IN FATIMA? REASON # 1 AGAINST AD ORIENTEM!